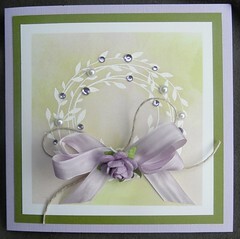 This is a card I have made for my next card class at Create on Garden. I love this Hero Arts stamp - so versatile. The flower is from Kaisercraft, Ribbon from Martha Stewart. I stamped the wreath with versamark then embossed with white embossing powder. I then used Tim Holtz Distress Inks over the image.